Brew Yourself Some Chocolate—Win Choffy! 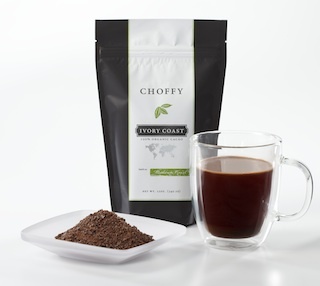 Eight lucky readers will win Choffy—that’s two full-size packages of —100% ground cacao that’s brewed like coffee (a $30 value)! Experience what brewed coffee is like—and take advantage of cacao’s health benefits in a new way! Win Choffy! We’ve heard about the health benefits of chocolate, well this is brewed chocolate—a way to reap benefits without adding the sugar and fat of regular chocolate candy. Don’t get me wrong, I still like chocolate candy (dark, and in moderation), but this product intrigued me greatly. I was sent a few varieties of Choffy to sample, here’s what I thought. Choffy does not taste like hot cocoa/hot chocolate. I sort of thought it might. It does have a distinct flavor that is chocolatey, but since it is brewed, it reminded me of a cross between coffee and tea. It seemed thin in texture compared to coffee, but more flavorful than tea—just my feeling. After trying it on its own, dark, I did end up mixing the Choffy with my coffee grounds and liked the blended product a lot. It had great flavor, yet still tasted like my coffee. Adding a little skim milk or cream and a drop of stevia made it taste a bit like the favorite mocha latte from the coffee shop down the street—but less sweet, which I welcome, frankly. I find flavored coffee drinks waaaay too sweet in general. So what are the health benefits of Choffy? Well, it contains lots of antioxidants (plenty of polyphenols)—good for crushing pesky free radicals in the body. It also contains caffeine of course, since that’s present naturally in cacao bean. Beyond that, theobromine, a natural chemical related to caffeine, is also in all chocolate products. Theobromine is a mild stimulant that acts as a vasodilator, helping to improve blood circulation. As an added bennie, some people may find that their cravings for sweets diminishes with Choffy consumption. Choffy contains no added chemicals, gluten, sugar, or dairy—it’s simply 100% premium, roasted cacao beans that have been ground. Amazing! There are a variety of Choffy products to choose from on their website. You’ll note that it’s rather like choosing coffee, in that they have their own flavor profiles and are single estate beans from specific areas of the world. Some are darker (like the new Ivory Coast Dark), but all are small-batch roasted. I thought Choffy was an interesting and tasty addition to my coffee pot, though I’m sure some people will enjoy it all on its own. Want to try Choffy for yourself? 1. Sign-up for our free e-newsletter (no spam ever!). 2. “Like” Appetite for Health on Facebook, and please “Like” Choffy on Facebook, too. 3. Leave us a comment below (not on Facebook please) telling us why you’d love to win Choffy. Remember, extra credit is given to those who share AFH nutrition or fitness articles on social media–tell us where you shared (a link is handy)! Open to US residents. Entries will be accepted until midnight EST on Monday, September 30th. All AFH Terms and Conditions Apply. I heard Choffy was good for migraine sufferers- I’d like to try it! I shared an article on Pinterest but I’m unable to post the link right now- I don’t know if the Internet is being wonky right now or it’s my iPad? I drink 11/2 cups of choffy every day, my fuel of choice for energy. I’d love to win Choffy to try it out. I love tea and am looking to try something new. Choffy sounds really interesting and I’d like to try it. I am not a coffee drinker but usually need some caffeine in the morning and am wondering if this will fit the bill plus be good for me. Choffy sounds like heaven in cup! DON’T pick me to win, even though I believe I would qualify, I’m already a Choffy drinker, and a distributor. But it IS amazing! The healthy energy keeps me going through the day, and because it’s 100% cacao, it helps to curb my sweet tooth – and at 20 calories I can drink as much as I want! I am really interested in trying Choffy. I love coffee and chocolate, especially together! This really sounds line an interesting product! I would love to try this, especially if it would help with my sweets cravings! Liked, shared and twitted! I have a friend who drinks..I have yet to try it. Sounds wonderful though! I would like to try sumthing different.i have always been a caffe nero girl,but would love to try something new. I would love to win this for my husband. He loves coffee and chocolate and it’s almost his birthday. I love my Choffy in the morning. Feel great and keeps energy going. I do want to try mixing it with coffee…sounds yummy. That sounds so good. Would love to win. When I was a kid growing up in NY, NOTHING made the kitchen smell more like HEAVEN than when Mom Sylvia would make Hot Cocoa from scratch!! Us kiddies would come in from playing in the snow, rosy cheeked, and co-o-o-old; we’d take off our boots and jackets, place out mittens, hats and scarves on the radiators to dry out and then we’d run into the kitchen to sit down to steaming mugs of PURE HOT CHOCOLATE!! Oh Sweet! Thick! Warming to our tummies. and then…. when we had emptied our mugs, our hats and scarves and gloves would be dry and we would RUN outside to play again! THANK YOU MOM!! !And Thank YOu Choffy for creating this wonderful cocoa!!! Wow, I love chocolate, and coffee! Can’t wait to taste them together. Will it be similar to a Cafe Mocha?! You don’t often find something that’s good and is also good for you.. Wow! I am not a huge coffee fan, but love my chocolate and tea. I am intrigued to try this! I would love to try Choffy! Sounds like it’s right up my alley with the chocolate, coffee, caffeine aspects going on! I would take this to brew at work and share with my fellow night-shift nurses! Wow! I’ve never heard of this! I suspect it is fabulous, and I also suspect that I would want to have it with my coffee, but would certainly try it alone as well. I’d love to win some Choffy because I love it already and love to share it with friends too. I would like to win it because I have never tried it, and it sounds like it has great benefits! Trying to cut back on coffee and I need a good substitute. I would love to win the Choffy!!! I ran out in the spring and I need more for this winter. It really keeps me warm. Wow, what a nice product, I would love to try this, I like coffee but the caffeine doesn’t agree with me. It would be wonderful to be able to enjoy an alternative that is also loaded with antioxidants, amazing!!! I would love to try Choffy because I LOVE coffee and I always like to try healthy new stuff. 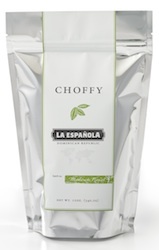 I would love to try Choffy because I LOVE coffee and I’m always trying new healthy stuff! My husband and I are big coffee drinkers we both have about 2-3 cups a day. I on the other hand am a HUGE chocolate lover, I know most women are. I love coffee and I would love to try and satisfy my chocolate craving right in the morning with some great Choffy! Also the fact that it has “magical” powers 😉 is a plus also! This sounds delicious! I’d love to try it! Wow..looks interesting. and seeing that I LOVE DARK Chocolate…don’t fancy very sweet. and coffee tickles my fancy I would really like to try. And the Antioxidants is such a bonus. Choffy…yum yum!.. :) Love your description too…so sounds like me…felt like I could taste it! I love both coffee and tea and chocolate. 🙂 I also have depresion and hope some theobromine might lighten my day. I want to try it because it is packed with antioxidants and provides healthy energy. I subscribe to the AFH free e-newsletter. I would love to try this since I am going through breast cancer treaments and could really use antioxidents. I liked AFH’s Facebook page already. I also liked Choffy’s page. My favorite coffee is moca.This would be great and I would love to try it. I am a coffee addict and would love to try something new and different. I would love to win Choffey to have an alternative to coffee. I never tried or heard of it before and would love it try it. Thanks for the chance! I’m new to the website (love it!) and new to Choffy(would love an opportunity to love it!). I’ve never heard of such a product and am legitimately upset that no one has previously alerted me to it’s existence! I work in Food and Beverage industry, and I’m currently a DT student…for all of these reasons and so many more I would LOVE to win! I’m not a huge coffee drinker, but would love to try this! I’d love to win this because I love discovering new, healthy products that I can share with my patients. That and I LOVE chocolate and coffee and this sounds like a fabulous fall time treat! What a wonderful treat and combination. Simply perfect for Fall and Winter. Thanks. I liked Chofy’s page. Need a treat after breast cancer diagnosis. Thank you for the giveaway! I cannot drink coffee but Choffy is amazing… but expensive! I don’t drink coffee, but this seems like it might be a fun alternative to tea! Plus I love having new items like this to recommend to my students! Choffy sounds good. I’d like to try it. I would love to try Choffy-it sounds great- all natural. I have changed my whole diet and would love something excellent to drink- this sounds like it. CHOFFY? never heard of it – would love to try it, WHY? because it’s something new to try! It sounds really interesting and I’d love to try something new. I hope I win! would love the extra antioxidants…I work with kids and lots and lots of germs. brewed chocolate…. who wouldn’t want it??? I haven’t heard of Choffy before. I would love to have a cup! I’ve been drinking Choffy for almost 2 weeks now. I love the flavor and it gives me a great boost of energy! I appreciate it’s health benefits. I’m not a coffee drinker, but brewed chocolate just sounds delicious and I would love to try it. Plus, I love the added bonus of antioxidants! I’ve never heard of this before but I would love to try it! I’m a coffee fiend so this would be fun to try. And it would be great to have something delicious and good for you! I shared on Pinterest, too. This sounds like something I would like- brewed chocolate…. yum!! Cancer runs in my family: my mom died of it and both of my uncles have it. 🙁 I need it for the antioxidants. I drink a pot of coffee everyday which does me no nutritional good…but this would! I am so excited to hear about this product. I have been looking for an alternative to coffee and I am not that big of a fan of tea. Choffy sounds like it would be the perfect fit! Sounds so interesting and delicious! Plus all the health benefits? awesome! I’d love to try it!! Oh im trying to get myself off coffee and would love to try this! Wow.. Choffy sounds great.. interestingly delicious.. I like the idea of mixing it with coffee.. I would love to try a taste.. and add it to my coffee drinking.. Thank you for the Choffy opportunity.. Sounds interesting. Id like to try something besides coffee. I love coffee and chocolate and this sounds like something I would really like! would definitely like the win this supply of Choffy! Choffy sounds good. Coffee and Chocolate together.Wow what a great idea. Sounds Delicious, would love to try. Signed for free e newsletter, like AFH, like Choffy on FB and posted on FB, Twitter, Pinterest. Would love to try Choffy due to I was medically informed to cut down on caffein and this sounded like a great alternative. Especially every producy AFH advertises or sponsors I have never ever went wrong on being a first time tryer and long term buyer. Thank you AFH and Choffy for bringing healthier products for us to try and love. This sounds like the perfect drink for me, I love mochas and drink way too many of these high calorie drinks, I need to take my health more seriously as I am 52 years old. I subscribe to the e-newsletter, Like Appetite for Health and Choffy on Facebook. I’d love to win love to win Choffy because I’m a caffeine and chocoholic. I started to drink green tea in the morning for the antioxidants but still miss my coffee. This would be a perfect substitute! Can’t wait to try Choffy! I would love to try Choffy! Chocolate meets coffee? Who wouldn’t want to win that!! Drinkable chocolate sounds good. Sometimes hot chocolate is too much. Choffy sounds like antioxidant heaven in a cup! MMMMMMM Would LOVE to win! This sounds interesting.. This might be something to introduce the people at the hospital we nurses all love our chocolate and coffee. I would really like to try this Choffy…..it should be filled with a gazillion antioxidants! much needed. I would love to try Choffy since it’s very healthy and will fill me with energy that I need to start my day! I get the nesletter and like on Facebook and would like to try Choffy because it sounds good. Choffy sounds like the perfect mix for a chocolate and coffee lover! Sounds absolutely delicious! Not only that but healthy for you too, Would be awesome to win and be able to try it. i would love to try this. I am always looking for healthy alternatives. Thanks! Would love to try this to help with my sweet tooth cravings. I too am a regular AFH subscriber, liked Choffy on FB, and posted this link on FB. I’d love to try this to further my goal of cutting down caffeine in the morning, and yet still get my chocolate fix! Thank you. Love love love chocolate!!!!!!! Love knowing I would be drinking a chocolaty health drink. I’ve never head of Choffy! I’m super excited to try it! I love chocolate and coffee. How could I go wrong with this. I only like coffee with chocolate so this sounds like a perfect option! I’d like to win this because I can’t drink coffee. In fact, I had to give up all coffee (including decaf) and most teas. I am constantly surrounded by people drinking or brewing coffee and I love the smell but I can’t have any. Even 3 sips made me sick for hours the last time, almost a year ago, so I haven’t had a single sip since then. I would really like to find an alternative and I love chocolate. I can tolerate chocolate so I don’t know what it is in most teas and coffees that bothers me. I’m always looking for a way to cut out the sugar. I don’t like coffee, so Choffy sounds like a great alternate. Would love to give it a try! I would love to suprise my husband with a nice cup of CHOFFY! I would love to try it. sounds like a real treat. anything chocolate is up there in my book. Some of the stuff out there cause major headaches so this i will try. This sounds like a very interesting product. I love chocolate, so I would love to try this! My husband and I are big coffee drinkers we both have about 2-3 cups a day. I on the other hand am a HUGE chocolate lover, I know most women are. I love coffee and I would love to try and satisfy my chocolate craving right in the morning with some great Choffy! Also the fact that it has “magical” powers is a plus also! I’m so curious! I love chocolate, I love coffee, I’d love to win this Ch-off-y! Sounds like a match made in heaven! This sounds intriguing. I love coffee as well as cocoa so I would love to see what this tastes like. I’d love to try this because it sounds good and I like the fact that it has antioxidants in it. Signed up for your newsletter! Thank you! I have not heard of Choffy and since I’m a chocoholic, this is right up my “ally” lol. I would love to try it! Chocolate health benefits without all of the fat! 🙂 Thank you! Chocolate and coffee sound amazing! I’ve never heard of Choffy before so I’d love to be able to try it first. But ground cacao sounds awesome! Even without the health benefits, anything that comes from the original form of chocolate has to be good!! This will definitely be shared on Twitter and Facebook, ’cause I think everyone should be aware of this incredible use of the cacao bean. Loved the Ivory Coast with creamer in it! 100% beans, antioxidants. Sounds yummy.Can’t wait to try it. I’d love to have a new hot drink to add to my winter warm-ups by the fire! I can’t wait to try it if I win! AND you can’t beat the health benefits! I just want to say I drink “CHOFFY”, it sounds really healthy. I am just learning about cacao and rally want to try it with my loved ones. These sound very interesting. Would love to try Choffy. Would love to win the Choffy!!! Perfect time of year to start drinking the hot drinks!!! I would love to win Choffy and treat myself and my loved ones to delicious, healthy antioxidants! I am not a huge fan of coffee but I love tea. I would love to try it since it I love chocolate. I am intrigued by this hot chocolate drink and would love to try it! Would love to win this and give it a good try. Julie.. Colleen as in me?? Colleen Dilg Gibson?? I’m always looking for healthier alternatives and a way to make better choices when it comes to my vice items, like coffee! I’d also like to win because I’m on a college student’s budget!! I tried choffy at a Women’s Expo and was blown away by its flavor. So I bout a bag. Un like coffee it tastes amazing with out anything added to it. Plus I have finally found a pick me up in the morning with out getting the common rock gut that coffee always gave me. The best part of it all is its health for you. I am a very healthy eater and always said that coffee was my only clutch in life. Well since that expo I am happy to say that is no longer the issue. But I am excited to try the different once. I have only ever tried the dark. I am happy I came across this page. I’ve only just heard about Choffy for the first time today, but it seems like an amazing new drink to try! Especially for a chocolate lover that is trying to avoid dairy / hot chocolate.